Starting a low carb diet changes us and our kitchen cabinets. No, we don’t mean resurfacing or new hardware. Take an honest inventory and make some changes for your new low carb diet. Carb-proof your pantry, overhaul your fridge and stock up with the right low carb kitchen staples. 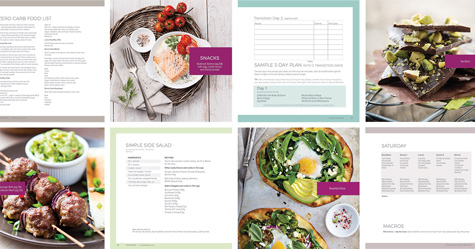 Use our printable low carb grocery list and you’ll shop with confidence. Clear out the junk food! This means candy, chocolate, ice cream and high carb foods. No matter WHAT, the junk food has to GO. It’s time to create a better healthier kitchen. Check the labels of all packaged and prepared foods and determine ‘net’ carb counts. Total carb grams minus fiber grams = net carbs. If someone you live with can use the high carb food you’re removing from your life, try making separate shelves in the pantry for them. Don’t want anything risky in the kitchen? Give away or donate your old favorites. A local food bank or charity that takes food donations is a possibility, especially for packaged and canned foods. Doing a kind deed is a great way to launch a “healthier, better you” plan. 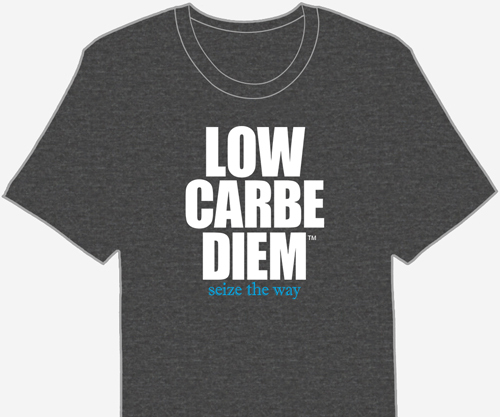 On low carb you’ll eat more fresh produce, meats and other perishable foods. Your refrigerator and freezer will be fuller, and stocked with storage containers. It’s time to get some better low carb grocery options in the house, and change what’s in your fridge. Can’t keep the all foods you love? Maybe you can. Barbecue sauce? Usually loaded with sugar. Mustard? Usually not. Candy? Keep dreaming. Severely limit or stop eating your old favorites. Replace these foods with new, low carb versions. The choice is yours, but some low carb dieters can’t always give up easy lunches and sweet treats. There are many excellent brands of low carb bread. Here’s a complete guide to eating bread and printable list of 30+ store-bought low carb choices. The breads on the list are available in grocery stores and have 1 to 10 net carbs per serving. Try low carb tortillas and pita (about 7 carbs per serving) for an easy lunch wrap. Fortunately, low carb chocolate is available in drugstores, grocery stores and online. The best chocolate choices add healthy fats to your low carb plan and won’t derail your hard-earned progress. Out with the old, and in with the new! When you change your way of eating, it’s best to have food in your kitchen that supports your new low carb mission. One of the worst situations is to find that you are hungry without anything appropriate to eat. If you’re starting a low carb diet, there are certain items that you MUST have in your low carb kitchen to whip up quick and easy recipes. Water is the most important thing on ANY diet, especially a low carb diet. Aim to drink 8 glasses of water a day. Try a Brita filtered water container in the fridge, a pitcher on your desk or bottled water. Jazz up ordinary water with Splenda-sweetened flavored packets. Choose a full variety of shredded and block cheese. Salami and sliced gourmet cheese makes a flavorful, new snack. Shredded cheese is quick and easy to add to any meal for flavor, extra protein or fat. Low carb vegetable bags of broccoli, peas and cauliflower are perfect for side dishes and stir fry. The baby spinach bags quickly transform fresh salads and burritos. Whether it’s carrot sticks, celery sticks, cucumber slices, eggplant circles, zucchini slices or cauliflower, keep a variety of vegetable snacks in your low carb kitchen. Enjoy crunchy veggies raw with dips. Steam veggies and top with cheeses, spices and sauces. When possible, use olive oil for cooking Roma or cherry tomatoes, fresh green beans, asparagus and any other low carb veggies you enjoy. Not sure which veggies are low carb enough? Check the Atkins low carb fruits and vegetables list for net carbs. Have a good supply of herbs, onion and garlic on hand. Limit canned veggies. Most lack nutrients and some are high in sodium. Read every label, and check for added starch and gluten. Be adventurous! Stop by the market and try something new. Low carb kitchens don’t have to be boring. Salmon is high in healthy omega 3. How about some extra lean ground beef or pork chops? Grab some steamed shrimp for a cocktail or get smoked salmon for breakfast. Avoid hot dogs containing nitrates, and sliced deli meats with gluten and starch fillers. Low carb tortillas are perfect for making lunch wraps and breakfast rolls. They also hold all sorts of hot, low carb dishes. With 7 net carbs per tortilla, tortillas are a “prepared” low carb item that I use almost daily. To satisfy carb cravings try Unreal Candy. It’s an all-natural, healthy low carb choice with 6 to 11 net carbs per serving, and no artificial ingredients or sugars. Keep plenty of cream cheese on hand for a quick, Atkins-friendly low carb cheesecake. Whipped heavy cream flavored with vanilla, lemon or mint is a unique topping for the cheesecake or an after-dinner coffee. How about homemade low carb ice cream? Try a low carb ice cream or sherbet recipe, or a keto pop, Icee, Frosty, fudgsicle or frozen yogurt. Starting a low carb diet requires making different choices at the store. With a low carb grocery list, these foods are easy to select without sabotaging your results. A simple grocery list organizes your trip – saving you time when you hit the store.